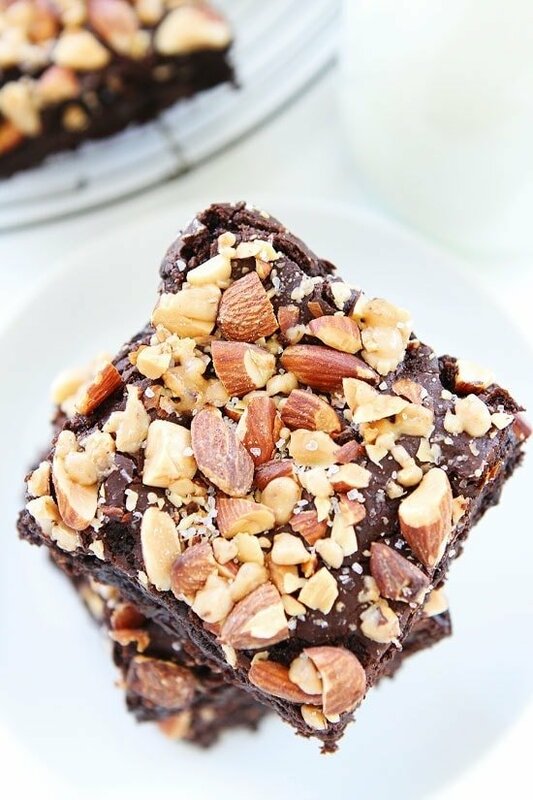 Almond Toffee Sea Salt Brownies-rich, fudgy brownies with toffee, almonds, and sea salt. These brownies are perfection! There is a new brownie in town and you need a formal introduction. Friends, please meet Almond Toffee Sea Salt Brownies. These decadent brownies were born and baked in my kitchen. 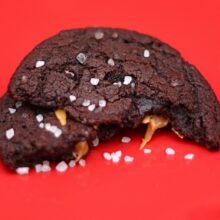 They are loaded with chocolate, toffee, almonds, and sea salt. They like to be eaten straight from the pan, with a scoop of ice cream, or with a glass of milk. They also like to be shared, so invite your friends and family to enjoy these brownies with you. And they do like to be baked often, so keep this recipe handy. I don’t think that will be a problem though, you will fall in love after one bite! Now, that you have been formally introduced to my Almond Toffee Sea Salt Brownies, let’s sit down and have a little chat about them. They are pretty much the best brownies ever. The brownies are rich and fudgy and would be good on their own, but I don’t stop there. I add chocolate chips and toffee to the brownie batter. After pouring the batter into the pan, I top the brownies with more toffee and chopped Oven Roasted Sea Salt Almonds. 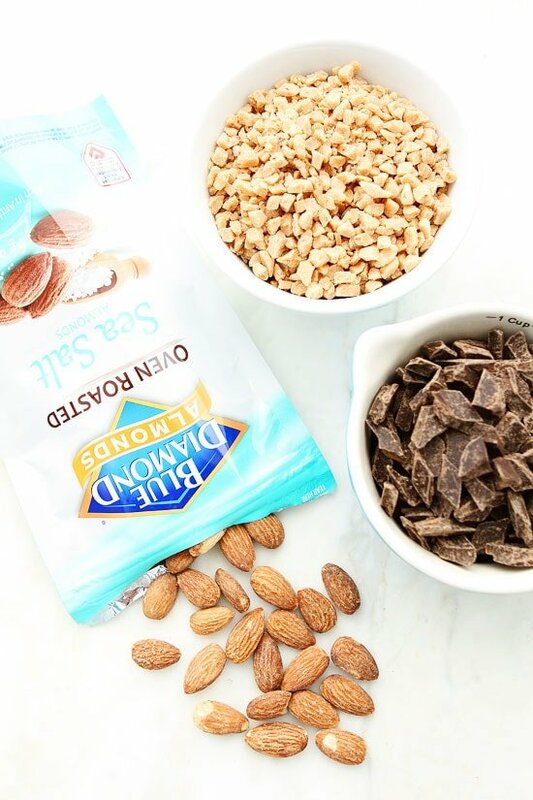 Have you tried Blue Diamond’s Oven Roasted Sea Salt Almonds? They are my current favorite snack. I eat them by the handful. The hint of sea salt is perfection. I knew the almonds would be a great addition to my brownies. 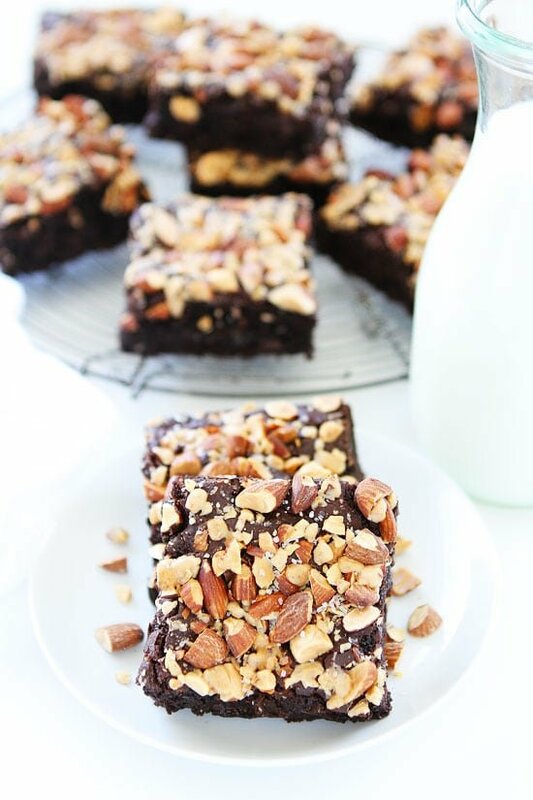 The almonds make the brownies pretty and I love the crunch and salty kick. I like to sprinkle a little extra sea salt on top of the brownies before baking because sweet and salty is my jam! I am sooooo in love with these brownies! 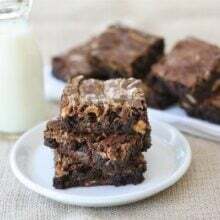 By now, you should feel like you are pals, best buds, bff’s with my Almond Toffee Sea Salt Brownies. The only thing left for you to do is to make them, eat them, and love them! Enjoy! 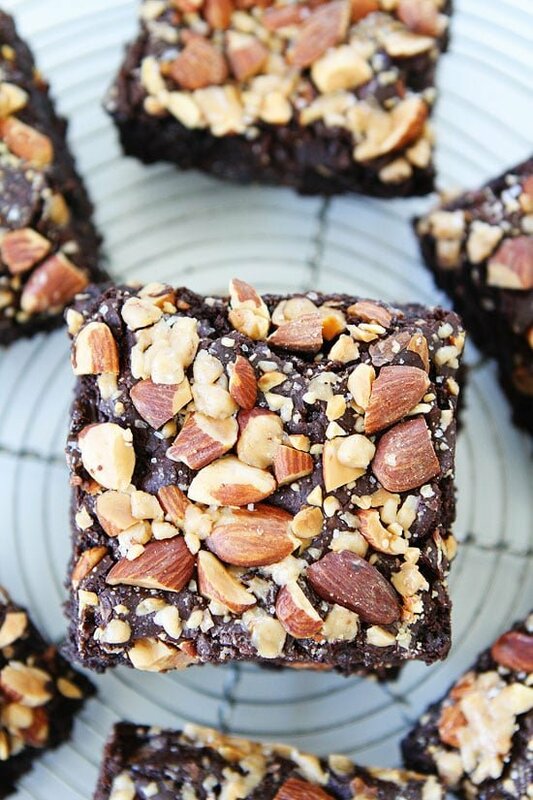 Rich, fudgy brownies with toffee, almonds, and sea salt. These brownies are perfection! In a medium-sized saucepan set over low heat, melt the butter, then add the sugar and stir to combine. Stir until mixture is shiny, but do not let it bubble or boil. Remove from heat. Stir in the cocoa, baking powder, sea salt, and vanilla extract. Stir in the eggs and stir until smooth. Add the flour, chocolate chips, and 1 cup of the toffee bits. Stir until smooth. Pour the batter into prepared pan. Sprinkle remaining toffee and chopped almonds evenly over the brownie batter. Sprinkle with additional sea salt, if desired. Bake the brownies for about 30 minutes, or until they are set and a toothpick inserted into the center comes out clean, or with just a few moist crumbs clinging to it. Remove pan from the oven and cool on a rack. Cut into squares and serve. Note-the brownies will keep in an airtight container for 2-3 days. They are great served with a scoop of ice cream! I want to marry these brownies for REAL. Pinned! I have a huge bag of those exact almonds in the pantry…they’re my favorite mid-afternoon pick-me-up!! I think they need to go on these brownies though…OMG they look amazing! Holy Moly yuuummmmy!! 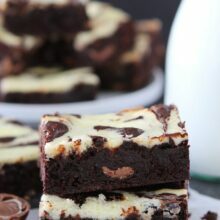 Mmmm I’ve been craving brownies for ever, these looks perfect! Regular brownies are beautiful, but these brownies are DROP. DEAD. GORGEOUS. 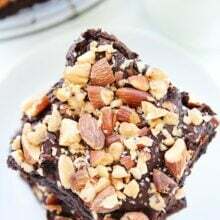 I love the sound of topping brownies with crunchy almonds! I LOVE how loaded this brownie is!! Team brownie for the win! Can’t wait to try this version! Stop. Stop stop stop. This is all I want in a dessert. Chocolate, fudgy, salty & sweet, and crunchy. Absolute perfection, Maria! Thanks! They are the perfect dessert! These look luscious and decadent – just like a brownie should. Thanks for sharing. 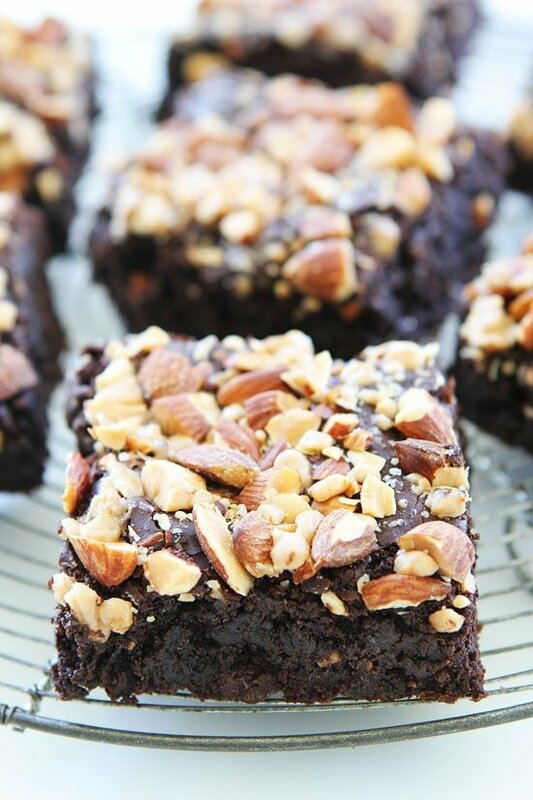 Blue Diamond nuts are my fav, especially the sea salt flavored ones–so on brownies–yes!!! these look decadent and totally delicious! Thank you so much for introducing us! I’m in love! Pinning! Oh, man, brownies with almonds AND toffee? Sounds like heaven to me! Well, there certainly IS a new brownie in town! I’ve never strayed from walnuts in brownies, but considering that I love almonds in chocolate bars, this makes total sense! And toffee too…heaven! The almonds make the brownies! I hope you like them! This may be my new favorite brownie recipe. Of course I haven’t tried it yet but those almonds look so good. I am not a fan of walnuts in brownies so I’m excited to try with almonds. Thanks for sharing and I can’t wait to try this recipe. It’s my new favorite brownie recipe! I hope you like them! These look DREAMY and like my perfect kind of brownie. Oh mt! These look so dang good! I’m sure I would fall in love with these after one bite! Delicious! 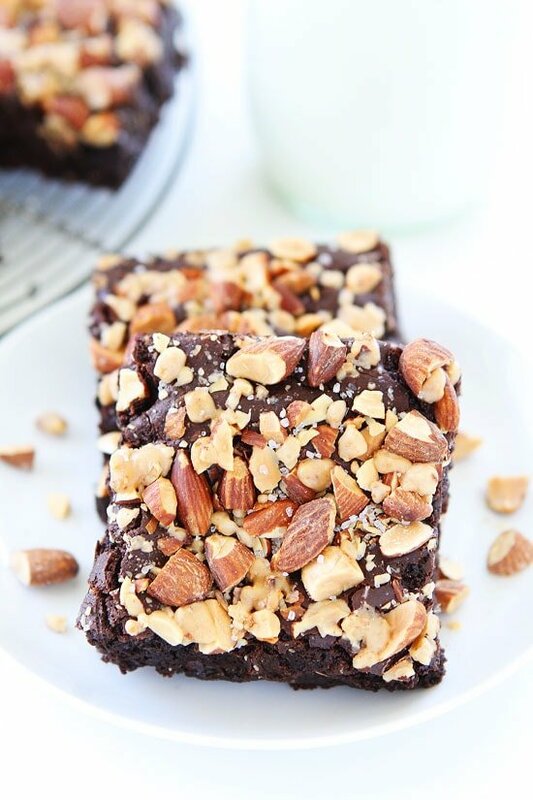 The almonds and toffee add so much to these yummy brownies! Ouch for $8.50/lb almonds, but hooray for one bowl brownies. This brownies looks amazing delicious! Thank you SO much for your delicious recipe! This was my first homemade brownie ever and it is a HUGE HIT! 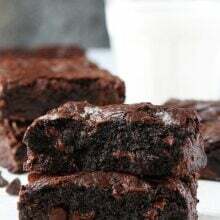 I used dark chocolate cocoa powder and my husband said they are better than the Giradelli dark chocolate brownie mix we usually use (and the brownie we thought could not be beat!) I really enjoy all of your delicious creations, thank you so much for sharing with us! I am so glad you liked the brownies! Made these this weekend and they were amazing! I have never had much luck with homemade brownies (always end up with a too cakey texture), but these were wonderfully fudgy and had great flavor. Not too difficult to make, even with 3 toddlers “helping” in the kitchen. The saltiness was just perfect. Will definitely be making again! How much of the almonds do you put in the batter? It doesn’t say. The almonds just go on top. You can add some to the batter too if you want! Thank you for what is really for-real the best brownie recipe I’ve ever made. Wrote about it here – http://www.weirdlittlefrenchcookie.com/almond-toffee-sea-salt-brownies/ – not joking about them being the best I’ve ever had. I’m keeping this recipe! What kind of toffee did you use?